The top of the heap among wrestling cards (at least for now), 2018 Topps WWE Undisputed offers the high-end formula for another year. Exclusive to hobby, the premium boxes contain eight autographs and two relics. The hit-per-pack program mirrors that of the 2017 release, but the 2018 set sees a design overhaul to go with the hefty card stock. 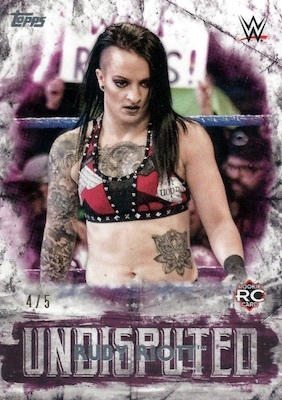 Again using a circular background to bring attention to the wrestler image, one noticeable addition to the base design is the large "UNDISPUTED" text box that also doubles as the nameplate. While this is a considerable refresh, the text-on-text concept can be disorienting. 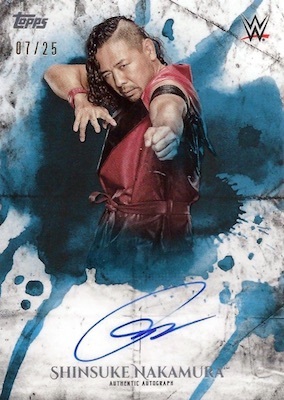 In addition, the 2018 Topps WWE Undisputed checklist features retrospective inserts for key WWE events. This includes 30 Years of Royal Rumble and 30 Years of Survivor Series, which both highlight prior match winners. Joining the base set and inserts are Orange (#/99), Green (#/50), Blue (#/25), Gold (#/10), Purple (#/5) and Red (1/1) parallels, plus four Printing Plates (1/1). Dropping eight per box, the 2018 Undisputed autograph designs are even more abstract, with many spots and streaks filling the backgrounds. The primary Undisputed Autograph set also includes the same parallels as the base cards. Dual (#/25) and Triple Autograph (#/10) options, each with Purple (#/5) and Red (1/1) parallels, increase the signed possibilities, while the Quad Autograph book cards are limited to just five copies. The one-of-one Tribute Cut Signature offerings are just for the WWE legends. Another primary hit, Undisputed Autograph Relic cards incorporate a signature and worn shirt piece. Parallels consist of Silver (#/50), Blue (#/25), Gold (#/10), Purple (#/5) and Red (1/1) editions. Another choice is the Autographed Kiss & Shirt Relic book (#/5), which features a jumbo shirt swatch and signed lips. Tagging in a second wrestler, Classic Matches Dual Autograph Relic and Rivals Dual Autograph & Championship book cards (#/5) have adversaries in mind. The Classic Matches insert contains event-used mat swatches, and Rivals has a commemorative championship medallion that ties into the bout in question. Filling the final two hits in the 2018 Topps WWE Undisputed box, the Undisputed Relic cards provide the same parallels as the main auto relic insert, while the Triple Shirt Relic set highlights a trio of wrestlers on each card. The triple relic also comes in Purple (#/5) and Red (1/1) parallels. Buy 2018 Undisputed WWE boxes direct from Topps for $250. PARALLEL CARDS: Orange #/99, Green #/50, Blue #/25, Gold #/10, Purple #/5, Red 1/1, Printing Plates 1/1. 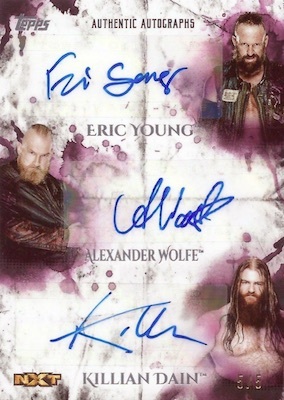 Shop 2018 WWE Undisputed autographs on eBay. 67 cards. Serial numbered #/199 or less. PARALLEL CARDS: Purple #/5, Red 1/1. 38 cards. Serial numbered #/99 or less. PARALLEL CARDS: Silver #/50, Blue #/25, Gold #/10, Purple #/5, Red 1/1. I heard this was pushed back. Any idea when? End of July, for now. 2019 TOPPS WWE UNDISPUTED WRESTLING HOBBY SEALED BOX - PRE-ORDER!